Description: All three works are from a late archaizing phase of the composer's career in which he paid tribute to beloved models from the past (music "In the Old Style" as it were). How this period was tied in with the ongoing World War II is a matter for discussion but the Serenaden is a four-movement work from 1942 which quotes Haydn and Ziehrer and pays tribute to Austrian folk music. The accompanying pieces were originally in string quartet form: Modo Antico (1938, arr. 1945) uses the Mixolydian, Phrygian and Dorian modes while Modo Classico (1941, arr. 1944) is in the spirit of Haydn. 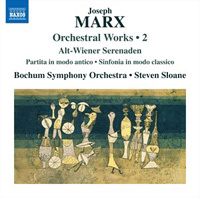 Bochum Symphony Orchestra; Steven Sloane. Original 2004 ASV release.